In his long prophetic poem Jerusalem, William Blake writes of stony Druid temples, where men reared mighty stones, danced naked around them. Blake was describing one of Britains stone circles, perhaps even that famous one known as Stonehenge. It was a circle in Montana on Blackfoot Indian land that inspired astronomy professor JUDITH YOUNG to undertake the UMass Sunwheel project  a circle 120 feet around which, after four years of existence with more modest markers, is now formed by 14 nine-foot-high granite monoliths  in a field south of Alumni Stadium. Although there has been a steady stream of visitors to the site from its inception, and an especially good turnout to celebrate this winters solstice on December 21, so far there have been no reports of naked dancing. Completed last November 9, the structure is a version of our first calendar and observatory, says the astronomer. She hopes it will help people experience the motions of sun, moon and stars in a more direct way. 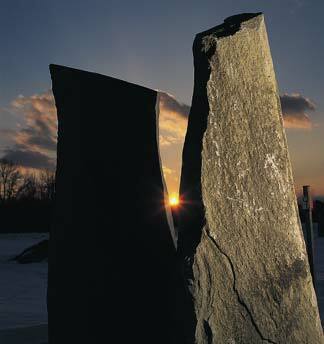 Initiated by Young in 1996, and the result of steady fund-raising by her, the sunwheel project was accomplished with the help of the Chester Granite Company of East Otis and Karls Excavation Company of Hadley.